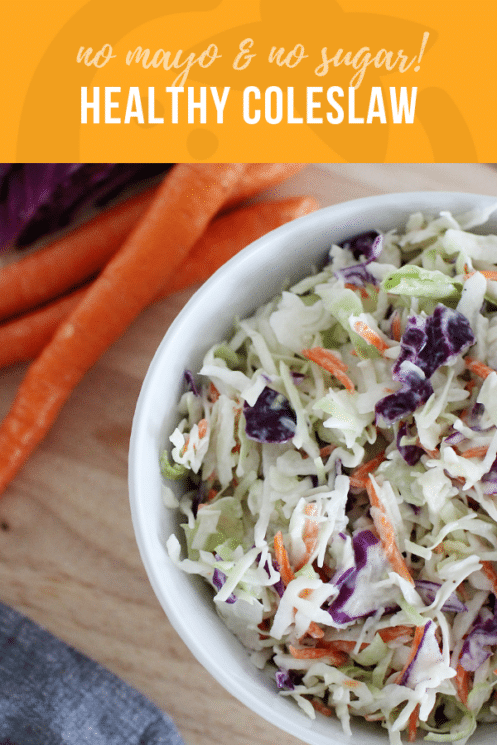 Create this healthy coleslaw recipe in minutes with the help of pre-made coleslaw mix and a simple, tasty dressing. With its itty bitty shreds of veggies and sweet creamy dressing, coleslaw is basically a salad designed to be loved by kids. And this particular healthy coleslaw recipe is equally designed for YOU, the one in charge of dinner! So what makes this particular recipe so ideal? First, it uses regular bagged coleslaw mix from your produce department. You don’t have to fuss with whole veggies, though if you’re a stickler for freshness, you can certainly take home a cabbage and go to town with the shredder. Second, the dressing for this coleslaw is beautifully basic, with just three main whole-food ingredients. (No mayo! No sugar!) So no matter how hectic your next weeknight family dinner is, you’ll be able to whip this recipe into shape and have a fresh, nourishing side dish with a little more zing than frozen peas. Speaking of sides, let’s talk about pairings. 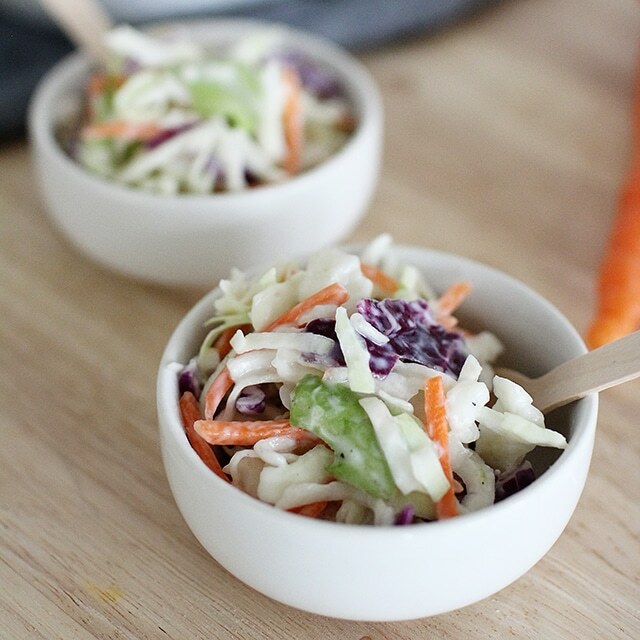 This healthy coleslaw recipe tastes great beside grilled chicken, steak, or baked beans. Or try piling this slaw on top of Instant Pot Pulled Pork Sandwiches. Like all coleslaw recipes, this one tastes best the day it’s made. So go ahead, have a second serving. What Makes this Coleslaw Recipe Healthy? Let’s be real: any time our kids want to dig in to a heap of raw vegetables, we’re psyched. 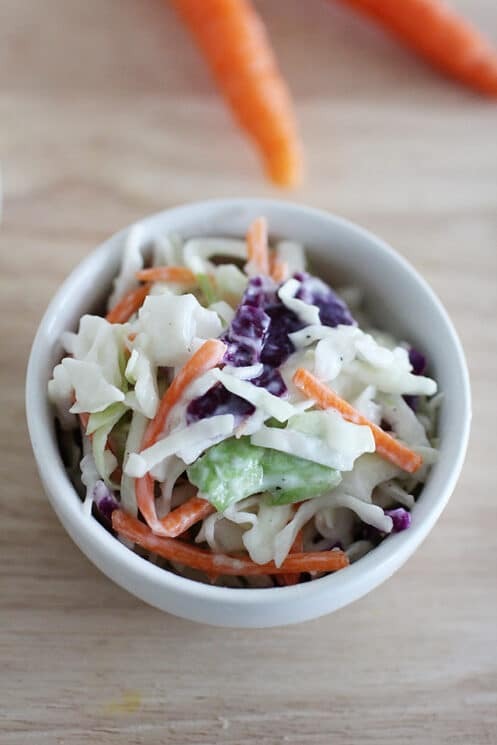 Fresh, crunchy cabbage and carrots shine bright in just about all coleslaw recipes, and this one is no exception. All those veggies serve up super nutrition like Vitamins K, C, and A, plus fiber and antioxidants kids’ bodies need to support long term health. 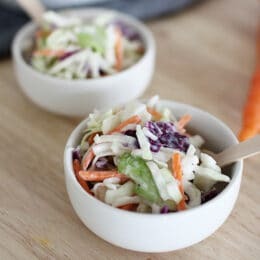 What makes this coleslaw recipe unique is that you mix up the simple dressing entirely from minimally-processed, whole-food ingredients. That means no mayo or refined sugar whatsoever. Instead, you’ll whisk together plain yogurt with cider vinegar and a touch of honey to get that trifecta of creamy, tangy, and sweet that a good coleslaw MUST have. 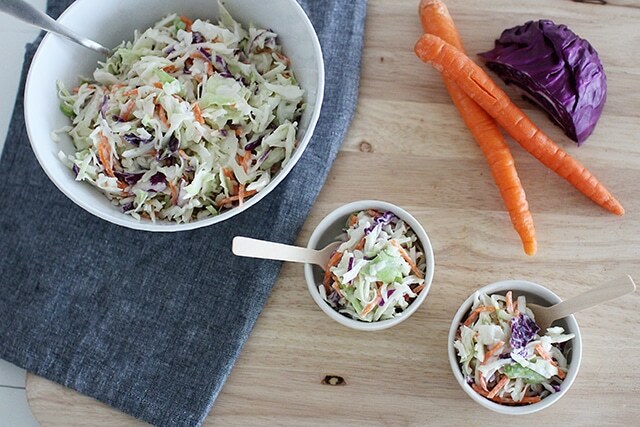 If you and your kids really like coleslaw (or are practicing liking it!) 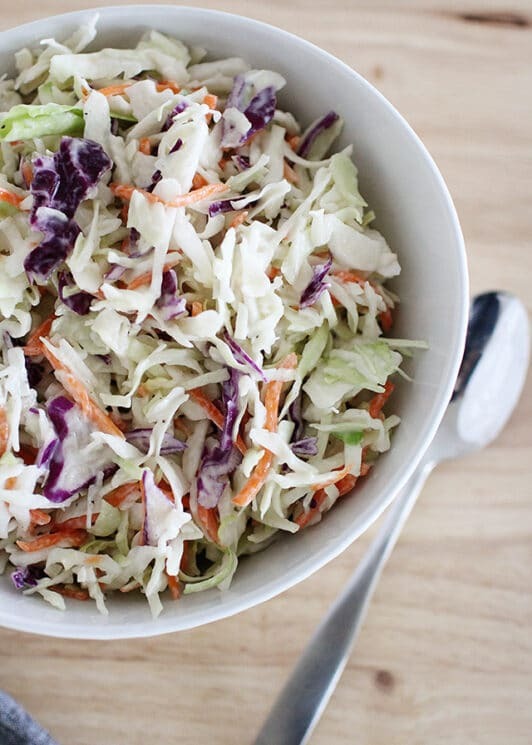 check out some more healthy coleslaw recipes below. Both of these recipes are also mayo-free and sweetened without sugar. Add coleslaw mix to a large bowl. In a small bowl, whisk together honey, vinegar, yogurt, salt and pepper. Add to veggies. Mix well to fully coat. Chill in an airtight container until ready to serve.